When you are between the hammer of the Nigerian Navy and the anvil of the Nigerian Government, what is a Nigerian judge to do, if not make a very public show of doing nothing? In a new hearing in a Lagos court yesterday, Nigerian judge James Tsoho (centre) repeated the pattern of his predecessor, Judge Okechukwu Okeke, and again postponed the trial of the crewmen of Russian security tender, Myre Seadiver, this time for another three months. 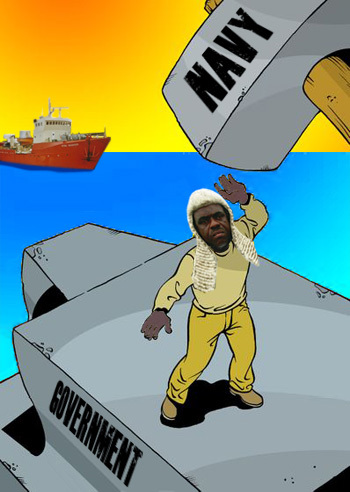 The judge is caught between Nigerian government officials embarrassed but too weak to drop their charges of illegal port entry and arms smuggling, and Nigerian Navy officers strong enough to arrange the arrests of the crewmen and vessel on trumped-up charges, and protective of the Navy’s sideline business of selling vessel security service in Nigerian waters. Pirates in uniform are what this story has been about from the beginning, as one click will illustrate. What Judges Okeke and Tsoho, Prosecutor Ernest Ezebilo, Foreign Minister Olugbenga Ashiru, Rear Admiral Ameen Ikioda, and Ambassador Assam Ekanem Assam add, which tales of Somali, Chinese or Indonesian pirates lack – it’s a sense of humour as they go about their hostage-taking business. How else to understand their method when at last month’s hearing the Nigerians released eight of the 15-man crew of the Myre Seadiver on the ground they were all new arrivals by plane, although three left behind for trial were among the plane arrivals, and three of those set free had in fact landed in Lagos aboard the Myre Seadiver. Arrested by the Navy on October 20, when their vessel was seized and towed to the Beecroft Naval Base, the 15 Russian mariners, captained by Andrei Zhelayzkov, were imprisoned without charges for four months. Charges of illegal entry and arms smuggling were not brought by Nigerian prosecutors to court until February 27, when the men were bailed to the custody of the Russian Embassy in Lagos. Okeke failed to show up in court for the trial date of April 10. He was then replaced by Tsoho, who has now postponed the trial four times. According to the vessel owner and operator, Moran Security Group of Moscow, the vessel did not enter Lagos until it had received from its Nigerian agent authority from the Navy and Lagos authorities permitting entry and allowing a small inventory of arms – 34 automatic rifles and 8,600 rounds of ammunition. These were declared on entry, and a month later verified as undisturbed on board when the vessel was preparing to depart. That’s when a Navy patrol intervened, making the record which, were it admitted in court now, would prove there had been no smuggling at all. But Tsoho has refused to call for witnesses from the Nigerian Navy or the Lagos police. No documents have been entered into evidence, and at yesterday’s hearing there was no cross-examination. A source in the courtroom said there “was absolutely nothing new in the hearing, conducted between the lawyer for the crew, the prosecutor and the judge.” Tsoho has set a new court date of October 9. Russian Foreign Minister Sergei Lavrov claimed publicly last December that he had telephoned his Nigerian counterpart, Nigerian Foreign Minister Ashiru, and extracted from him a promise to accelerate the evidence testing and bring the court proceedings to a conclusion. Lavrov was ignored, and he has done nothing since. By contrast, Lavrov has intervened repeatedly in private and in public on behalf of Oleg Deripaska and United Company Rusal, in their battle with the President of Guinea, Alpha Conde, and his advisor, American George Soros, 1,850 kilometres to the northwest. On the Myre Seadiver case Lavrov is working pro bono.